Marvel Comics has gone cancellation crazy just a few months into its Marvel Legacy initiative. The axing of nine titles is especially puzzling because these books fell under the Legacy banner, suggesting to retailers and readers that they would be sticking around for the foreseeable future. That’s not the case for already cancelled and soon-to-be cancelled books likes America, Generation X, Hawkeye, Iceman, Jean Grey, Luke Cage, Royals, and U.S. Avengers, and most of these feel like premature cuts concluding series that have so much more potential. The major exception is The Unbelievable Gwenpool, the metafictional series that is turning cancellation into a tragic plot point. Gwenpool has had a fascinating year, and writer Christopher Hastings has been finding cool ways to break through the fourth wall while exploring the struggles of a new character trying to establish her longevity in a superhero universe. Since the game-changing arc pitting Gwenpool against her future self, Hastings has started to explore what it means for a character to know that their title is getting cancelled, and although Gwenpool wants to be a hero, she knows her series is going to end if she continues down that path. It’s taken the series in a surprisingly poignant direction, but there’s also a lot of commentary here regarding broader character appeal and editorial demands. 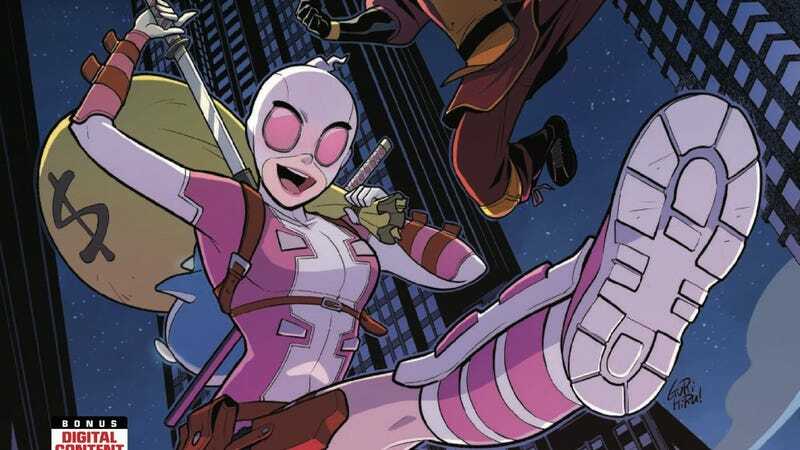 This exclusive preview of The Unbelievable Gwenpool #24 has Gwen trying to avoid her inevitable fate by getting schooled in villainy by her old friend Batroc the Leaper. The relationship between Gwen and Batroc is one of the warmest aspects of this series, and it makes sense for her to turn to him when her days are numbered. Main artist Gurihiru returns to the series for this penultimate issue, and this excerpt immediately highlights their talent for immersive environments full of animated characters when Batroc and Gwen show up at The Casino In The Sky. Expressions are big, the comic timing is sharp, and the action is full of force, and the final page is a great example of how this book has allowed Gurihiru to play around in ways they’ve never done before. Gwenpool is on the way out, but it’s leaving with the original creative team putting a clever spin on a sore situation.